Full of CHEER to Begin the NEW YEAR FREEBIE!! Home FREEBIESFull of CHEER to Begin the NEW YEAR FREEBIE!! I hope you are enjoying your break! I’m so sad that an entire week is already gone. Time just goes WAY too fast! January in first grade brings a lot of changes and tremendous academic growth. We are always so busy. I love my class but they were quite chatty and just a tad whacky before we went on break. Some of the kiddos just let all of our rules fly out the window. That’s to be expected with all of the excitement that December brings. But I want to be sure we quickly bring things back on track. So… I’m adding a little New Year’s inspiration to our behavior routine. I printed the poster borderless on an 8 1/2 x 11 sheet of card stock. After laminating it (for durability and added thickness) I placed large pieces of magnet tape on the back. It will sit on my front white board where I can easily access it to check off stars for each “good behavior” they display. It’s also a perfect non-verbal reminder. The one above prints borderless on an 8 1/2 X 11 sheet of paper. The one below will print on two sheets of paper which can be attached to one another for one long poster. The tattling, arguing and whining over the last few weeks just about drove my batty. I have every intention of encouraging all that fabulous kindness that I know they are capable of bringing to class. For the most part, my kiddos are very good about cleaning up after themselves. The last few weeks, however, brought about some hasty “let’s just throw that there” and “I’ll just shove this in my desk” actions. We’ll get things back on track in January. This one is an ongoing problem. With the increase in expectation and the digging deeper we will be doing with many of our standards, the kiddos are going to have to be “ready to learn”. I will be doing all I can to help encourage listening the first time. I use Listen Up! activities a lot to help develop this skill. This one is for the few that take FOR.EV.ER to finish even the simplest assignment. This should encourage them to work for the “team” and speed things up. 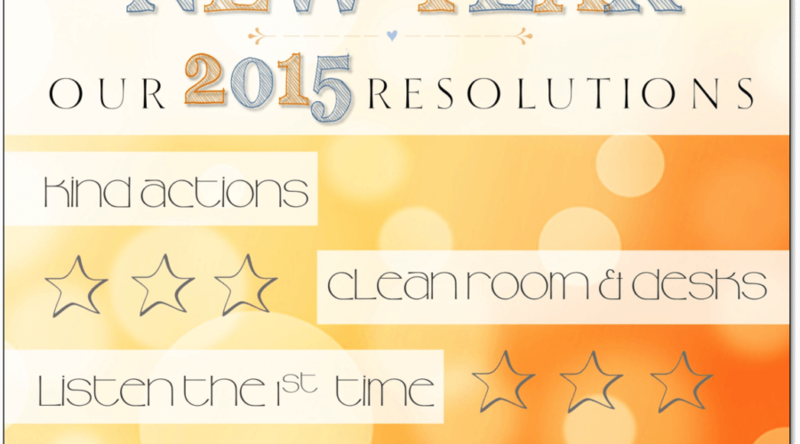 Click on either of the images to download a copy of this little New Year Behavior Management. I’m going to start this first thing Monday morning. We will talk a bit about resolutions. That’s a hard topic for 1st graders. I have this fun little project that helps with that discussion and helps them understand the meaning behind resolution. This little cutie looks adorable slip sliding on our “snow” covered bulletin board. Click any of the images to grab a copy of the My Resolution for the New Year! resource. Speaking of resolutions… mine is to do a better job of letting things go and living in the moment. What’s yours? I go back on the 5th – instead of focusing on that I need to simply enjoy this little break. I intend to cram a whole lot of fun into this week! What’s your resolution? When do you go back? What fun have you had over this break? P.S. You Might Also Like . . .